Last Saturday's game was always going to be a big challenge given where England were, so the big question now is what kind of reaction we will get? A lot of players who performed at a really high level over the last two seasons have had a different type of spotlight put on them. It will be interesting to see what the reaction is. There was always going to be one or two changes, but I don't think Joe Schmidt had five in his head. The problem is that the attrition levels in this championship are huge. Losing Robbie Henshaw at the last second wasn't ideal. And 'Murphy's Law' losing another second row in Devin Toner undermines the problems we had coming in with on the back of Tadhg Beirne and Iain Henderson being sidelined. It's the type of scenario that happened four years ago at the World Cup. We have planning for years to increase our depth, so this championship offers us the chance to give guys who are in the wider squad an opportunity of playing at the top level only seven or eight months out from another World Cup. Scotland have been building for some time. As an attacking force they are really potent. Gregor Townsend had a lot of these players with Glasgow and did a brilliant job with them. If you look at the back three - Stuart Hogg, Tommy Seymour and Sean Maitland - were all on Lions Tours. In Finn Russell, they have one of these mercurial geniuses at number 10, who is liable to do anything. He certainly has brought a maturity to his game since he has gone to Paris. There is no question that there is a huge attacking threat there. However, I have question marks over their front five. In the context of our injuries, they lost their tighthead prop WP Nel after 25 minutes last week. He is a massive loss in the context of this game because Ireland will certainly chase them in the scrum. They also have injuries in the back row - John Barkley and Hamish Watson were part of the side two years ago when they beat us - they are also out. Ireland have problems in their own back row, but Sean O'Brien has a huge opportunity now being brought in from the start. Ireland failed to win a single turnover last week and that's where O'Brien will be hoping to make an impact. From a carrying perspective, it's also big opportunity for Jack Conan. The game. as it always does, starts and finishes up front. Ireland were on the back foot right from the off against England so that can't happen again if the likes of Johnny Sexton and Conor Murray are to make the type of positive impact that we know they are capable of doing. All top players can have an off day, particularly at half back. Half backs are totally dependent on the quality of ball they have up front. Ireland were on the back foot all day against England and lost all the collisions and that enabled England to put a lot of pressure on Conor Murray. His kicking game was not as accurate as it normally was. That filtered back into Johnny Sexton and you could see them barking at each other a few times. I'd certainly back Murray and Sexton to deliver on Saturday. They'll be hurting this week. Peter O'Mahony was put up in front of the media last Monday and he was another player who didn't have his normal impact last week. I'm expecting a massive performance from those three players. I'd be confident that Ireland will bounce back. Scotland, as we know can score tries and sprinted out of the blocks in this game two years ago. They went ahead early on and Ireland found it difficult to recover. The key to this game is that opening 20 minutes. 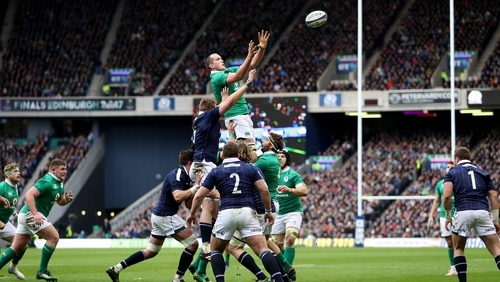 Ireland need to re-establish themselves and let these Scottish fellas know who the boss is. Scotland were vulnerable defensively In the Italian game last week, a game that they were in control of, but did conceded three tries in the last eight minutes. I think it will be a tight game for long periods, but I fancy Ireland to respond, not only with a performance but also with a win. Donal Lenihan was speaking on RTÉ Radio 1's Morning Ireland.